ლევენტე პოლიაკი (კურატორი და ურბანული პოლიტიკის მკვლევარი) წარმოადგენს KÉK - უნგრული თანამედროვე არქიტექტურისცენტრი (ბუდაპეშტი). მათ ინიციირებული და განხორციელებული აქვთ მრავალი ღონისძიებები, კვლევითი პროგრამები, პუბლიკაციები და საერთაშორისო თანამშრომლობითი პროექტები. ორგანიზაციას აქვს დიდი გამოცდილება პროფესიონალების, ხელოვანების, კულტურის პროდიუსერების და თეორეტიკოსების ერთმენეთთან დაკავშირებაში და თანამშრობლობაში. ვაკანტურობის თემა KÉK-ისთვის დიდი ხნის კვლევის საგანია. შარკა სვობოდოვა და იაროსლავ სედლაკი წარმოადგენენ 4AM არქიტექტურის და მედია ფორუმი (ბრნო). 4AM წარმოადგენს ექსპერიმენტული მიდგომების და არქიტექტურასთან დაკავშირებული აქტივობების ფართო დიაპაზონის, ურბანიზმის, ურბანული სივრცეების, თანამედროვე ხელოვნების და ახალი მედიის ღია პლატფორმას. ამგვარი ინტერდისციპლინარული სამუშაო სტრუქტურის ფარგლებში და ორივე მხარის, პროფესიონალებისა და საზოგადოების ჩართულობაზე აქცენტის გაკეთებით, კითხვის ნიშნის ქვეშ დგება და კრიტიკულად განიხილება მიმდინარე კულტურული და სოციალური ფენომენი, მათთან დაკავშირებული საკითხები; ეს ყოველივე ხდება ღია დისკუსიების, საერთაშორისო ვორკშოფების, ლექციების, გამოფენების და საჯარო სივრცეებში ღონისძიებების მეშვეობით. 2013 წლის იანვრიდან 4AM არის KÉK-ის პროექტის VAC (Vacant Central Europe) პარტნიორი. Levente Polyák (curator and urban policy researcher) representing KÉK - Hungarian Contemporary Architecture Centre (Budapest), have initiated and managed a variety of events, research programs, publication projects and international cooperation. The organisation has a long experience in bringing together professionals, artists, cultural producers and theoreticians for cooperation. The theme of vacancy has been long-term issue for KÉK. Šárka Svobodová and Jaroslav Sedlak representing 4AM Forum for Architecture and Media (BRNO). 4AM is an open platform of experimental approaches and a wide range of activities related to architecture, urbanism, urban space, contemporary art, and new media. Within such an inter-disciplinary framework and with emphasis on the involvement of both professionals and the general public, current cultural and social phenomena, related issues and questions are both articulated and critically observed through a variety of forms of open discussions, international workshops, lectures, exhibitions and events held in public venues. 4AM has been partner in KÉKs project VAC (Vacant Central Europe) since January 2013. KÉK, 4AM GeoAIR-თან თანამშრობლობით გთავაზობთ პრექტს VCEE (ვაკანტური ცანტრალური და აღმოსავლეთ ევროპა). ამისთვის გეპატიჟებით 10 დღიან ვორკშოფზე თბილისში. პროექტი ცენტრალური და აღმოსავლეთ ევროპის ვაკანტური სივრცეები არის პროექტის VAC (Vacant Central Europe / ვაკანტური ცენტრალური ევროპა) გავრცობა, რომელიც ინიციირებული იყო 2013 წელს ორგანიზაცია KÉK - უნგრული თანადემროვე არქიტექტურის ცენტრის მიერ. პროექტის მიზანია, წარმოაჩინოს ვაკანტურობის პრობლემა ცარიელი უძრავი ქონების რუქების შექმნით, დაგეგმარების მეთოდების კვლევით, არქიტექტურული საშუალებების ძიებით, გამოცდილების გაზიარებით და მათში ინტერვენციების დაგეგმვის სტრატეგიებით, რაც დროებით დატვირთავს ამ ცარიელ ნაგებობებს და მიანიჭებს სხვა შესაძლო ფუნქციას. პროექტის მიზანია, ეკონომიკური კრიზისის ნეგატივი და პოსტ-ინდუსტრიული რესტრუქტურიზაცია გარდაქმნას შასაძლებლობაში - პროექტის ერთ-ერთი მიზანია, დაეხმაროს არასამთავრობო ორგანიზაციებს,სოციალურ საწარმოებს და ასევე, საზოგადოებრივ ჯგუფებს აღმოაჩინონ და დროებითი გამოყენებისთვის ჰქონდეთ წვდომა ამ ეტაპზე დაუკავებელ, უფუნქციო ნაგებობებზე. ამგვარი ინიციატივებისთვის სივრცეების პოვნით, პროექტი იღებს კატალიზატორის ფუნქციას, რომ დაეხმაროს ორგანიზაციებს ითანამშრომლონ სხვა სახის ინიციატივებთან ერთად, გამოიყენონ ერთი სივრცე, გამოაჩინონ და გაიზიარონ თავიანთი ძლიერი მხარეები. პროგრამის აქტივობები მოიცავს ორგანიზაციების იდენტიფიკაციას; მათთვის შესაბამისი ცარიელი სივრცეების პოვნას და დაკავშირებას; ამ სივრეების დროებითი გამოყენებისთვის იურუდიული და კომერციული კონტრქტების ნუმუშების განვითარებას; ორგანიზაციებისთვის კონსულტაციის გაწევას შეიმუშაონ სამოქმედო სტრატეგია; მოახდინონ მოლაპარაკება მეპატრონეებთან; პროფესიონალური და ფართო პუბლიკის მომცველი ღონისძიებების ორგანიზებას. პროექტის მთავარი მიზანია შაიცვალოს ლოკალური პოლიტიკა ვაკანტურობის საკითხისადმი. ამ სივრცეების დროებითი გამოყენება ხელს შეუწყობს ამ ნაგებობების გადარჩენას სრული განადგურებისგან, რადგანაც მათი უმრავლესობა არის უფუნქციო და მიტოვებული. ხშირად არასაკმარისი ფინანსური სახსრების გამო სახელმწიფოს არ აქვს საშუალება მათ მოუაროს, რის გამოც მრავალი ასეთი შენობა იყიდება, უკეთეს შემთხვევაში იძენს კომერციულ დატვირთვას, უარეს შემთხვევაში განწირულია დასანგრევად. დროებითი გამოყენებით არასამთავრობო ორგანიზაციებს, სოციალურ საწარმოებს, საზოგადებას და ინდივიდუალურ პირებს შეუძლიათ აამაღლონ ცნობიერება და შექმნან სხვა შესაძლებლობები და ფუნქციები გამოუყენებელი ინფრასტრუქტურებისთვის. KÉK in collaboration with 4AM and GeoAIR will work on a project VCEE (Vacant Central and Eastern Europe). 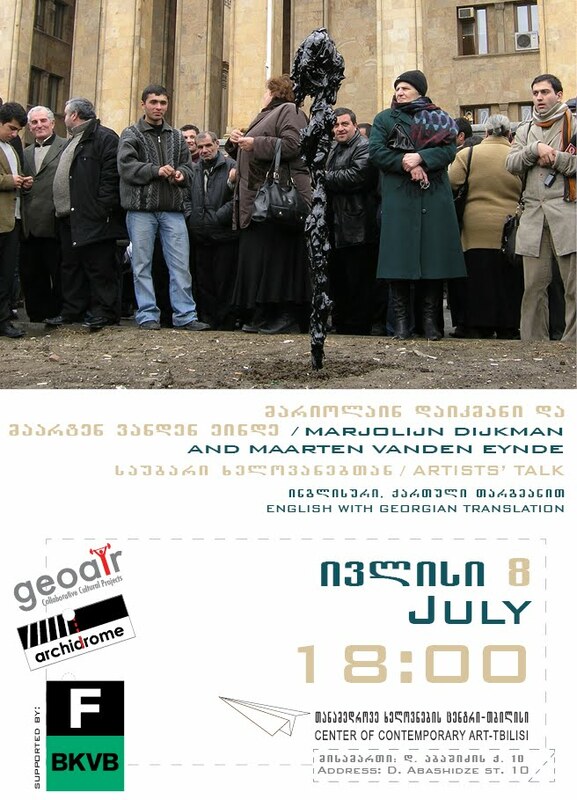 For this we organise 10-Day workshops in Tbilisi. The Vacant Central and Eastern Europe project follows the project VAC (Vacant Central Europe) initiated in 2013 by KÉK -Hungarian Contemporary Architecture Centre. It aims to address the problem of vacancy by mapping empty properties, by researching planning instruments, architectural tools and by exchanging experiences and strategies of intervention that make the temporary use of empty properties and their conversion for another use possible. The project's objective is to turn the negative effects of the economic crisis and post-industrial economic restructuring into opportunities - one of the target of the project is to help NGOs, social enterprises as well as community groups with social objectives to find and access vacant urban properties for temporary use. By finding space for these initiatives, the project aims to serve as a catalyst in helping organisations cooperate with other functions and uses in the same spaces, creating synergies and unfold their capacities. The program consists of activities including identifying local organisations in need of space; finding empty properties and matching them with the organisations; developing the samples for legal and commercial contracts defining the in-between use of these spaces; mentoring and incubating the organisations as well as helping them elaborate an organisational strategy; negotiating with owners; and organising professional and large public events. The main target is to change local policies approach to vacancy issue. Through temporary use of these spaces we aim to rescue these buildings from total destruction as many of them are out of use, abandoned and due to insufficient financial means state has no possibility to take care. Through temporary usage NGOs, social enterprises, community and individuals raise awareness and create other possibilities and functions for out of use infrastructures. პროექტის მონაწილეების რეზიდენციას ფინანსურად მხარს უჭერს ევროპული კულტურის ფონდი. Participants’ residency is supported by European Cultural Foundation.